Hi guys! There are many nail art contests hosted lately. The last two I entered have just ended and I'm already participating in the next one. This time it's the Animalistic nail art contest at Spooky Nails. I found it hard to come up with something animal-related which was original at the same time. Finally I came up with the flamingo bird, I was attracted by its corally pink color and the long, curved neck. So I went googling for some images and found some beautiful ones where the flamingos are relaxing in the water. Their pinky color formed such a nice contrast with the water and I immediately knew that I wanted to make something that would capture that contrast. 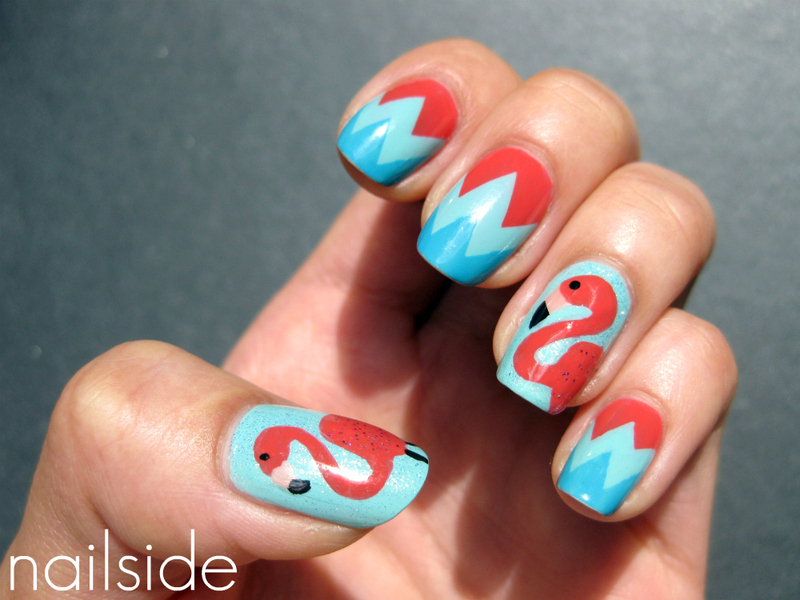 I tried to keep the overall look simple by using the flamingo design as accent nails only. The colors I used were Essence You're The One (corally pink), China Glaze For Audrey and Rimmel Sky High for the tips. I also added a layer of White Cap over For Audrey on my accent nails, which is barely visible in the pics. But in the second picture below, where I didn't add the birds yet, you can see it a bit better. There are many others participating in the contest, so please visit Spooky Nails to have a look at all the creative entries and vote for your favorite! Mooi, ik weet bijna zeker dat jij wint! The flamingos came out amazing! I love it! The colors and the shapes work so well, and it's definitely not your typical leopard print. I voted for you! Amazing as always!! That is beyond precious! I love it!! Aww this is so stinking cute ! this is so bright and fun! the flamingos are perfect looking! i really like this. Those are very cute! I will definitely go vote for you. AAAHHHHH! I love this so much! Flamingos are my absolute most favorite thing in the whole wide world and it never even occurred to me to mani them! I'm sorry I missed it, I would've given a thousand votes for you! I Love this! Great design and color combo!